The biggest difficulty I have always had is simply getting involved. Like you I am sure, I find my own life to be very busy and there is not much time available to get involved in my children’s schooling and it is so much easier just to leave it all up to the school. Also my children do not want me to be involved, they do not want to be picked out as having an interfering parent and would much sooner I just kept out of it! And of course I have chosen the school they attend because I believe it will do a good job for them so my tendency is to just let them get on with it. And I have found that schools often encourage that approach. They want parents involved if there are performances to attend, sports teams that need coaches or extra transport, fund raising for specific projects or discipline matters to attend to but involvement in the processes of learning? Generally not encouraged in my experience. But this is the area that pays the biggest dividends. Obviously textbooks, pens, books and other resources will need to be taken care of. What we are always seeking is to get our children into a rhythm, a habit of homework, review and study, which needs to start as soon as possible. – they will often need to get their blood-sugar levels up by eating first but homework should be next. – of course this won’t suit everyone but if you make things like TV, video games, the internet etc contingent on completion of homework then this process can become self rewarding. 2) as a vital part of homework, each night all notes completed during the day need to be reviewed – read through again. – this will enable the connections made in the brain during the day to be reinforced within 24 hours and facilitates the process of shifting information into long term memory. 3) as part of the review process, on a regular basis, maybe once a week, key-point summaries need to be made in each subject to consolidate the main ideas and act as the basis of study notes for the next exam. If this was done on a regular basis throughout the year it would eliminate all the pressure and study problems (eg. procrastination) come exam time. YES THAT’S ALL VERY WELL BUT HOW???? – when s/he’s got cricket practice, music lessons, tennis practice, dance classes, chess club, drama, etc etc…..
Well as I said it is all about habits and the only way we get our children into good habits is with clear rationale, good efficient systems and ongoing reinforcement – reason, process, rewards and (dare I say it??) punishment. 1) Reason: the most important thing we all need to get ourselves to tackle difficult tasks is a reason, a rationale, a purpose. This requires clear and consistent discussion in your household about the importance of education especially in a modern, technology driven, competitive world, and the connection between having good qualifications and having more choices in life. Qualifications confer the advantages of more choices and hence more opportunities. This may seem blindingly obvious to you but in my experience it is not always so for teenagers. 2) Process: this is our speciality – the proceeses of effective learning – if you are reading this then your children have most likely attended one of our seminars and will have these skills, they just need to practice them. If they haven’t yet done one of our courses, talk to the school and find out when we are coming back, or email me on taolearn@xtra.co.nz to find out when. A third option is to get a copy of my forthcoming book “”The Art of Learning – Companion Guide for Students” which contains all the information given to your children on our full 5 hour course plus lots more tips and strategies for effective learning. This book is due for release very soon and can be pre-ordered from the above email address. I can remember having great problems in this area when my daughter was in Year 11 and I also had one son in Year 10. My daughter always arrived home from school each day and immediately got stuck into her homework, completed virtually all tasks on time, was prepared to ask for help if she got stuck and studied well for exams. She was then (and still is) independent, organised, determined, persistent and strong willed. She has always strived for excellence in all her subjects and has been academically successful. Her mental strength is somewhat greater than her physical strength though and she has a tendency to engage in risky behaviour, to over-perform and to “burn out” physically. My son on the other hand has traditionally left his homework to the last minute each day, has not always completed tasks assigned, has not really studied at all, has not been very interested in pushing himself and has not ever considered himself to be at all academic. He has a “laid-back” view of school and learning in general and is happy to take life as it comes. He is dependent, disorganised, lackadaisical, social, gentle, kind and not particularly focused on anything. He has yet to learn how to push himself to 100% in anything and always works well within his abilities. So the challenge for me as a parent then, was how to keep my daughter out of trouble and within her own limits and how to get my son to take some responsibility for his own learning and his own academic success. In other words, how to help them both become more “educationally resilient”. So how have I helped my children in this area? I provide opportunities for them to push themselves to do things that maybe are more than they think they can do, challenge them to extend their limits and take a risk (within safe boundaries of course). This is easier than it may sound, certainly in New Zealand anyway. 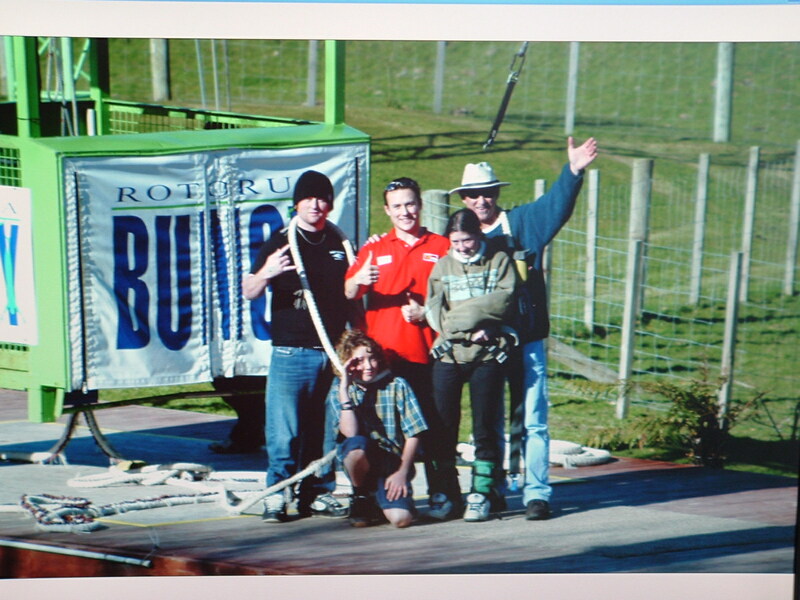 One thing I have done is to take all four of my children Bungy Jumping. Now a Bungy Jump is a unique opportunity to challenge yourself because when you are standing on the platform over a drop of over 100 metres (~350ft) with a rubber cord tied around your legs being encouraged to fall forwards the only thing that is going on inside you is that a part of your brain (the survival part) is saying NO! NO! NO! NO! – and you have to get past that block in order to take the jump. It is perfectly safe but it is a real challenge to get yourself to do it. I gave all four of my children complete autonomy over whether they took the jump or not but I asked them if they did do it to notice what went on inside of themselves – to notice the fear, notice the resistance and notice what they had to do to overcome that. I went first and then all four of my children followed, one at a time. They all reported it was a great moment in their life, they discovered something important about themselves and it was well worth it. Now I don’t know if you have any equivalents to Bungy Jumping where you live but if you have, in my opinion they are great learning opportunities, not to be missed. The corollary to this in school life means encouraging your children to tackle the difficult subjects at school, to take on new challenges, to try things that they think they might not be very good at. Resilience it seems only develops by practise and to practise resilience you have to risk having failure and you can only do that if you get outside your comfort zone. This of course raises one of the big issues in subject choice – should your children be encouraged to excel in subjects they obviously have a flair for, thus narrowing their range of choices and potentially their opportunities in later life, or should they be encouraged to try new subjects to develop new skills and gain new knowledge thus broadening their range of choices and possibilities in later life??? I have always taken a pragmatic, “a bit of both” approach. Making sure that each year my children have some subjects that they feel they are good at and can excel in and also some new subjects which will challenge them in new ways. The point is simply that no-one succeeds without failure and learning how to handle failure is the essence of resilience. This word “failure” has become such a loaded term that it is often difficult to get past the emotional baggage that goes with it but get past it we must. Each time your children do not succeed as they want to then that is a failure – a failure to live up to their own expectations. Failure is something to be expected, to be noticed and to be learned from. Failures provide excellent opportunities to create success. i) are you happy with this result? ii) how did you get this result – what process did you use to get this result? iii) what part of that process could be improved upon? iv) what will you do differently next time? – to learn from mistakes. Help your children to see the pleasures they take for granted in their lives – TV, computer games, internet time, even phone time, as rewards for getting their necessary work done. Help them to become self-monitoring and responsible with respect to all these everyday pleasures and make sure they are clear that you are prepared to take all those pleasures away if they are seen to be avoiding putting in the necessary effort. If you are thinking of rewarding your children during the year for school related success, make sure you are rewarding effort rather than outcome. In other words if you have noticed your son studying hard for a test or exam give him a treat as soon as the test is over as a reward for effort rather than when the results come out as a reward for result. This strategy causes the focus to be on the work necessary to achieve good results rather than the result itself which produces a more resilient response in future situations of challenging learning.